The Archduke Franz Ferdinand of Austro-Hungary was assassinated by Bosnian Serbs on 28 June 1914 to protest Austrian takeover of a largely Slavic province. Vienna was unable to find evidence that Serbia had sponsored the assassination but a month later issued an ultimatum to Serbia, which it knew would be rejected and thus lead to war. 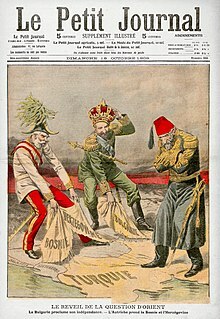 Austria-Hungary felt that Serbia had to be destroyed or else it would destabilize Austria by alienating Austria's very large Slavic minority element. Russia did not have a treaty obligation to Serbia but stood in opposition to Austria for control of the Balkans. In long-term perspective, Russia was militarily gaining on Germany and Austro-Hungary, and thus had an incentive to wait. Most Russian leaders wanted to avoid a war. However, in the present crisis they had the support of France, and they feared that failure to support Serbia would lead to a loss of Russian credibility and a major political defeat to Russia's goals for a leadership role in the Balkans. Tsar Nicholas II mobilised Russian forces on 30 July 1914 to threaten Austria if it invaded Serbia. Christopher Clark states: "The Russian general mobilisation [of 30 July] was one of the most momentous decisions of the July crisis. This was the first of the general mobilisations. It came at the moment when the German government had not yet even declared the State of Impending War". Germany now felt threatened by Russia and responded with her own mobilisation and declaration of war on 1 August 1914. At the opening of hostilities, the Russians took the offensive against both Germany and Austria-Hungary. European diplomatic alignments shortly before the war. On 30 July, Russia declared general mobilisation in support of Serbia; on 1 August, Germany declared war on Russia, followed by Austria-Hungary on 6th. Russia and the Entente declared war on the Ottoman Empire in November 1914, after Ottoman warships bombarded the Black Sea port of Odessa in late October. Unlike its Allies, Russia's Empire was one contiguous landmass but it also considered itself the defender of its fellow Slavs in countries like Serbia. Russian decision-making in July  was more truly a tragedy of miscalculation...a policy of deterrence that failed to deter. Yet [like Germany] it too rested on assumptions that war was possible without domestic breakdown, and that it could be waged with a reasonable prospect of success. Russia was more vulnerable to social upheaval than any other Power. Its socialists were more estranged from the existing order than those elsewhere in Europe, and a strike wave among the industrial workforce reached a crescendo with the general stoppage in St. Petersburg in July 1914. Foreign Minister Sergey Sazonov was not a powerful player. Historian Thomas Otte finds that, "Sazonov felt too insecure to advance his positions against stronger men....He tended to yield rather than to press home his own views.... At the critical stages of the July crisis Sazonov was inconsistent and showed an uncertain grasp of international realities. The tsar fired Sazonov in July 1916 and gave his ministry as an extra portfolio to Prime Minister Stürmer. The French ambassador was aghast, depicting Stürmer as, "worse than a mediocrity – a third rate intellect, mean spirit, low character, doubtful honesty, no experience, and no idea of state business." French ambassador Maurice Paléologue was also influential, repeatedly promising France would go to war along with Russia, which was indeed the position of President Raymond Poincaré. Serious planning for a future war was practically impossible given the complex rivalries and priorities given to royalty. The main criteria for high command was linkage to the royalty, rather than expertise. The General Staff had expertise, but was often outweighed by the elite Imperial Guards, a favourite bastion of aristocracy which prized parades over planning large-scale military maneuvers. The grand dukes inevitably gained high commands. At one critical point in 1915, when Grand Duke Nicholas failed badly, the tsar himself took over direct command and control of the entire Army, despite his incompetence. Meanwhile the tsar allowed the conniving monk Grigori Rasputin to exert enormous influence through his wife, including high-level appointments. The aristocrats finally assassinated him a few weeks before the tsar himself was overthrown. The infantry, artillery, cavalry, and logistics services suffered poor communications with one another. The Army was made up of peasants, who were ready enough to defend their own villages, but showed little national pride. Recruits from Russia's numerous minorities were often persecuted in the barracks. Russia depended heavily on the French alliance--a two front war against Germany was winnable, but not if Russia was alone. French ambassador Maurice Paléologue hated Germany and saw that when war broke out France and Russia had to be close allies against Germany. His approach was in agreement with President minister Raymond Poincaré who trusted him. He promised unconditional French support to Russia in the unfolding crisis with Germany and Austria. Historians debate whether he exceeded his instructions but they agree he failed to inform Paris of exactly what was happening, and did not warn that Russian mobilization might launch a world war. When on 28 June 1914 Archduke Franz Ferdinand of Austria was assassinated in Sarajevo Tsar Nicholas vacillated as to Russia's course of action. A relatively new factor influencing Russian policy was the growth of the Pan-Slavism spirit that identified Russia's duty to all Slavic speaking peoples, especially those who practised Eastern Orthodox Christianity. The growth of this impulse shifted attention away from the Ottoman Empire, and toward the threat posed to the Slavic people by the Austro-Hungarian Empire. Serbia identified itself as the champion of the Pan-Slavic ideal; Austria planned to destroy Serbia for that reason. Nicholas wanted to defend Serbia, but not to fight a war with Germany. In a series of letters exchanged with Kaiser Wilhelm of Germany (the so-called "Willy and Nicky correspondence") the two cousins proclaimed their desire for peace, and each attempted to get the other to back down. Nicholas desired that Russia's mobilization be only against the Austrian border, in the hopes of avoiding war with Germany. The Kaiser however had pledged to support Austria. 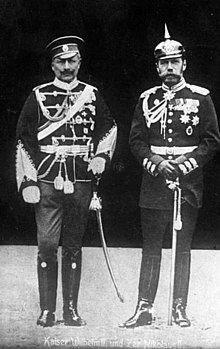 Nicky (Tsar Nicholas II) (right) with Willy (Kaiser Wilhelm) in 1905. Nicholas is wearing a German Army uniform, while Wilhelm wears that of a Russian hussar regiment. On 25 July 1914, Tsar Nicholas decided to intervene in the Austro-Serbian conflict, a step toward general war. He put the Russian army on "alert" on 25 July. Although this was not general mobilization, it threatened the German and Austrian borders and looked like military preparation for war. However, his army had few workable plans and no contingency plans for a partial mobilization, and on 30 July 1914 Nicholas took the fateful step of confirming the order for general mobilization, despite being strongly counselled against it. On 28 July, Austria-Hungary formally declared war against Serbia. Count Witte told the French Ambassador, Maurice Paléologue that from Russia's point of view the war was madness, Slav solidarity was simply nonsense and Russia could hope for nothing from the war. On 30 July, Russia ordered general mobilisation, but still maintained that it would not attack if peace talks were to begin. Germany, reacting to the discovery of Russian partial mobilisation ordered on 25 July, announced its own pre-mobilisation posture, the Imminent Danger of War. Germany requested that Russia must demobilise within the next twelve hours. In Saint Petersburg, at 7pm, with the German ultimatum to Russia expired, the German ambassador to Russia met with the Russian Foreign Minister Sergey Sazonov, asked three times if Russia would reconsider, and then with shaking hands, delivered the note accepting Russia's war challenge and declaring war on 1 August. On 6 August, Franz Joseph I of Austria signed the Austro Hungarian declaration of war on Russia. Before the war Russian planners had completely neglected the critical logistical issue of how the West European allies could ship supplies and munitions to Russia. With the Baltic Sea barred by German U-boats and surface ships and the Dardanelles by the guns of Germany's ally, the Ottoman Empire, Russia initially could receive help only via Archangel, which was frozen solid in winter, or via Vladivostok, which was over 6,400 kilometres (4,000 mi) from the front line. By 1915, a new rail line was begun gave access to the ice-free port of Murmansk by 1917. 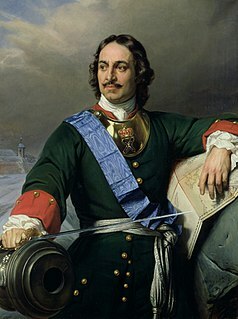 The Russian High Command was greatly weakened by the mutual contempt between Vladimir Sukhomlinov, the Minister of War, and the experienced warrior Grand Duke Nicholas who commanded the armies in the field. In spite of all of this, an immediate attack was ordered against the German province of East Prussia. The Germans mobilised there with great efficiency and completely defeated the two Russian armies which had invaded. The Battle of Tannenberg, where the entire Russian Second Army was annihilated, cast an ominous shadow over the empire's future. The loyal officers lost were the very ones needed to protect the dynasty. The Russian armies had some success against both the Austro-Hungarian and Ottoman armies, but they were steadily pushed back by the German Army. In September 1914, in order to relieve pressure on France, the Russians were forced to halt a successful offensive against Austria-Hungary in Galicia in order to attack German-held Silesia. The main Russian war goal had focused on the Balkans and especially on taking control of Constantinople. Ottoman entry into the war opened up new opportunities, but Russia was much too hard pressed to take advantage of them. Instead the tsarist government tried successfully to incite Britain and France to the action at Gallipoli. They failed very badly. Russia then incited Armenians to revolt, and the Armenians were massacred in one of the great atrocities of the war, the Armenian Genocide. 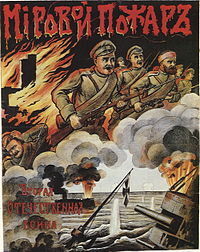 The combination of poor preparation and poor planning destroyed the morale of Russian troops, and set the stage for the collapse of the entire tsarist regime in early 1917. The German heavy artillery swept away whole lines of trenches, and their defenders with them. We hardly replied. There was nothing with which we could reply. Our regiments, although completely exhausted, were beating off one attack after another by bayonet ... Blood flowed unendingly, the ranks became thinner and thinner and thinner. The number of graves multiplied. Historians on the origin of the First World War have emphasized the role of Austria of Germany and the Austro-Hungarian Empire. The consensus of scholars includes scant mention of Russia, and briefly mentions Russia's defense of Orthodox Serbia, its pan-Slavic roles, its treaty obligations with France, and its concern for protecting it status as a great power. However one historian Sean McMeekin has emphasized Russia's aggressive expansionary goal to the south. He argues that for Russia the war was ultimately about Turkey, and that the Foreign Ministry and Army were planning a war of aggression against the Ottoman Empire from at least 1908 and perhaps even 1895. He emphasizes the immediate goal was to seize Constantinople and an outlet to the Mediterranean by control of the Straits. Reviewers generally been negative on McMeekin's revisionist interpretation. ^ However one historian Sean McMeekin has emphasized Russian plans to expand its empire to the South, and seize Constantinople and an outklet to the Mediterranean Sea. Sean McMeekin (2011). The Russian Origins of the First World War. Harvard UP. pp. 2–5. ISBN 9780674063204. ^ Christopher Clark, The Sleepwalkers: How Europe Went to War in 1914 (2013 p 509. ^ Dennis, Alfred L.P. (December 1922). "The Freedom of the Straits". The North American Review. 216 (805): 728–729. JSTOR 25112888. ^ David Stevenson, The First World War and International Politics (1988) pp. 31–32. ^ T. G. Otte (2014). July Crisis: The World's Descent into War, Summer 1914. pp. 123–24. ^ Peter Gatrell, "Tsarist Russia at War: The View from Above, 1914–February 1917." Journal of Modern History 87.3 (2015): 668-700 at pp 674-77. ^ Richard F. Hamilton and Holger H. Herwig. Decisions for war, 1914-1917 (2004) pp 121-22. ^ Christopher Clark, The sleepwalkers: How Europe went to war in 1914 (2012) pp 435-50, 480-84. ^ Sidney B. Fay, The Origins of the World War (1934) 2:443-46. ^ Katrin Boeckh, "The Rebirth of Pan-Slavism in the Russian Empire, 1912–13." in Katrin Boeckh and Sabine Rutar, eds. The Balkan Wars from Contemporary Perception to Historic Memory (2016) pp. 105-137. ^ Robert K. Massie (1967). Nicholas and Alexandra: The Fall of the Romanov Dynasty. p. 299. ISBN 9780679645610. ^ Hew Strachan, The First World War (2001) pp 297-316. ^ Richard Pipes (2011). The Russian Revolution. p. 207. ISBN 9780307788573. ^ Hew Strachan, The First World War (2001) pp 316-35. ^ Sean McMeekin, The Russian Origins of the First World War (2011) pp 115–174. ^ Sean McMeekin (2011). The Russian Origins of the First World War. Harvard UP. pp. 2–5. ISBN 9780674063204. ^ McMeekin, The Russian Origins of the First World War, pp 27, 29, 101 . Albertini, Luigi. The Origins of the War of 1914 (3 vol 1952). Bobroff, Ronald P. Roads to Glory: Late Imperial Russia and the Turkish Straits (I.B. Tauris 2006). Bobroff, Ronald P. "War Accepted but Unsought: Russia’s Growing Militancy and the July Crisis, 1914", in Jack S. Levy and John A. Vasquez, eds., The Outbreak of the First World War (Cambridge UP 2014), 227–51. Bury, J.P.T. "Diplomatic History 1900–1912, in C. L. Mowat, ed. The New Cambridge Modern History: Vol. XII: The Shifting Balance of World Forces 1898-1945 (2nd ed. 1968) online pp 112-139. Fromkin, David. Europe's Last Summer: Who Started the Great War in 1914? (2004). Geyer, Dietrich. Russian Imperialism: The Interaction of Domestic and Foreign Policy, 1860-1914 (1987). Jelavich, Barbara. St. Petersburg and Moscow: tsarist and Soviet foreign policy, 1814-1974 (1974). Jelavich, Barbara. 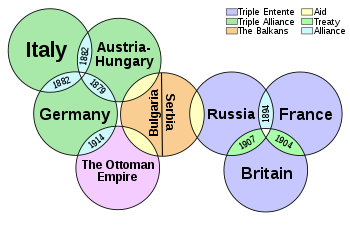 Russia's Balkan Entanglements, 1806-1914 (2004). Kennedy, Paul M., ed. (1979). The War Plans of the Great Powers: 1880-1914. ISBN 9781317702511. Lincoln, W. Bruce. Passage Through Armageddon: The Russians in War and Revolution, 1914-1918 (1986) pp 23-59. Lincoln, W. Bruce. In war's dark shadow : the Russians before the Great War (1983) online free to borrow pp 399-444. Menning, Bruce. "War planning and initial operations in the Russian context," in Richard F. Hamilton, Holger Herwig. eds., War Planning, 1914 (2010), 120–26. Rich, David Allen. "Russia," in Richard F. Hamilton and Holger H. Herwig, eds. Decisions for War, 1914-1917 (2004), pp 188–226. Ritter, Gerhard. The Sword and the Sceptre, Vol. 2-The European Powers and the Wilhelmenian Empire 1890-1914 (1970) Covers military policy in Germany and also France, Britain, Russia (pp 77-89) and Austria. Seton-Watson, Hugh. The Russian Empire 1801–1917 (1967) pp 677–697. Soroka, Marina. Britain, Russia and the Road to the First World War: The Fateful Embassy of Count Aleksandr Benckendorff (1903–16) (2016). Strachan, Hew Francis Anthony (2004). The First World War. Viking. ISBN 978-0-670-03295-2. Vovchenko, Denis. Containing Balkan Nationalism: Imperial Russia and Ottoman Christians, 1856-1914 (2016). Williamson Jr., Samuel R. "German Perceptions of the Triple Entente after 1911: Their Mounting Apprehensions Reconsidered" Foreign Policy Analysis 7.2 (2011): 205-214. Kramer, Alan. "Recent Historiography of the First World War – Part I", Journal of Modern European History (Feb. 2014) 12#1 pp 5–27; "Recent Historiography of the First World War (Part II)", (May 2014) 12#2 pp 155–174. Mombauer, Annika. "Guilt or Responsibility? The Hundred-Year Debate on the Origins of World War I." Central European History 48.4 (2015): 541-564. Mulligan, William. "The Trial Continues: New Directions in the Study of the Origins of the First World War." English Historical Review (2014) 129#538 pp: 639–666. The Kingdom of Bulgaria participated in World War I on the side of the Central Powers from 14 October 1915, when the country declared war on Serbia, until 30 September 1918, when the Armistice of Thessalonica came into effect. Germany entered into World War I on August 1, 1914, when it declared war on Russia. In accordance with its war plan, it ignored Russia and moved first against France–declaring war on August 3 and sending its main armies through Belgium to attack Paris from the north. The German invasion of Belgium caused Britain to declare war on Germany on August 4. Most of the main parties were now at war. In October 1914, Turkey joined the war on Germany's side, becoming part of the Central Powers. Italy, which was allied with Germany and Austria-Hungary before World War I, was neutral in 1914 before switching to the Allied side in May 1915.